These delightful tender pancakes make a perfect summer breakfast, especially if one has fresh berries for garnish. Syrniki (syr means cheese in Russian) is a traditional Russian and Slavic dish made of tvorog. Tvorog (also quark, topfen, twarog, tvaroh) is curd that is similar to cottage cheese and farmers cheese, but is thicker and drier, it is very well strained and whey is almost absent in it. Tvorog is not sold in chain grocery stores, so the closest results could be achieved with farmers cheese. Masha and I got greedy this time and made a lot of syrniki, 25 to be exact, so reduce the amounts accordingly. Put about 1 cup flour in a shallow dish and put aside (this is for coating pancakes). Mix well all ingredients, put a skillet on medium heat and add oil. Ideally the oil should cover half of the thickness of the pancakes, so you will need about 1/3" of oil in your skillet. The consistency of the cheese mass should not be runny, and hold onto the wooden spoon (see the picture). If it is not thick enough, add some more flour. With flour dusted hands form cute patties (about 1 heaped tb spoon of the mass per one pancake), gently coat them in flour, and put on the skillet, one by one, leaving some space between them. Watch syrniki frying on both sides, and don't allow them to get burnt. They should be nice and golden, with rounded sides. Remove ready pancakes from the skillet and place on paper-towelled serving plate to absorb unwanted fats. Serve with sour cream, syrup, jam, and fresh berries or fruit. 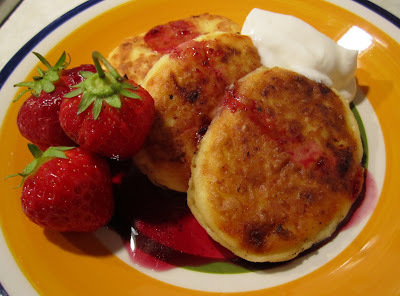 These pancakes are most tender inside with the sweetness balanced by sourness of cheese. With chilled sour cream and a handful of fresh berries they make a perfect comforting dish. They remind us of lazy Sunday mornings and carefree life. I'm ashamed to tell you, but we ate half of this plate at a time. If you are lazy or just have no time to make pancakes and deal with a mess on your range, make farmers cheese casserole. Use the same ingredients, but add half of the flour. Butter the baking pan, pour the mass into it, even out, and bake at 350 F until set and slightly browned. Let it cool a little, eat as you would eat a cheesecake, also with sour cream, jam, and fruit. It's healthier, and the taste is even better since in this case you have this buttery flavor (sometimes I even butter the top of this casserole when it is ready and out of the oven). Don't forget that imagination is the key, and try to play with fillings for these pancakes. Add some raisins or dried cranberries in the cheese mass - it will make the dish more attractive and even festive. Happy eating!